Frankfurt Airport is trialling a new robotic concierge called FRAnny to help passengers at the airport. 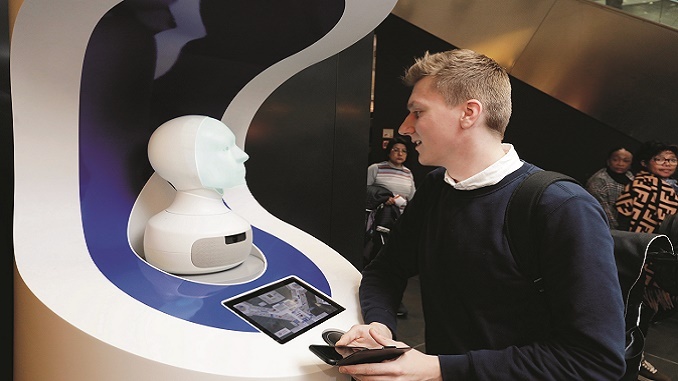 The socially intelligent robot is an expert on Frankfurt Airport, and is able to answer a wide range of questions – including the correct gate, the way to a specific restaurant, and how to access the free Wi-Fi. The thinking is that passengers at major transportation hubs, such as airports and train stations, are very often in need of guidance. In these scenarios, digital assistants and robots can support human personnel by fielding routine inquiries, thus enhancing the customer service offering. FRAnny is based on an artificial intelligence and a cloud-based voice-user interface (VUI) that can be deployed in a variety of forms – including in chatbots, voice assistants and robots. This digital customer service system was developed by a team of Deutsche Bahn IT experts. Using data drawn from the airport’s information system, FRAnny is able to understand and answer questions relating to travel, airport facilities and more. In addition to providing flight information, FRAnny is well versed in small talk and can communicate in German, English and seven other languages. The robotic concierge is a cooperative project between Fraport AG, the operator of Frankfurt Airport (FRA), and DB Systel GmbH, Deutsche Bahn’s dedicated IT service provider. Fraport and Deutsche Bahn have been jointly exploring the potential of artificially intelligent, voice-based customer service systems since 2017. The first pilot took place at Frankfurt Airport in spring 2018 using FRAnny’s predecessor: the four-week field trial was very successful. After approximately 4,400 interactions, 75 percent of passengers rated their exchange positively. Based on the feedback received, both the artificial intelligence (AI) component and the robot’s user interface were further improved. In June, the AI-based service is to be tested at Berlin central rail station – which has approximately 300,000 travelers and visitors every day. Human customer service agents at Deutsche Bahn’s information center will receive smart support from FRAnny’s sister, SEMMI.